I dig Conan. I have since I was in Junior High. What pre-teen boy wouldn’t? He’s strong, fast, powerful, and good with a sword, does what he wants, and always gets the ladies. And then there’s Red Sonja. To my pre-teen brain, she’s just like Conan but with less clothes and an awesome rack. (Ok, don’t go getting all up in face about sexism or objectification here; I’m speaking from my highly hormonally charged 13 year old brain… And seriously. 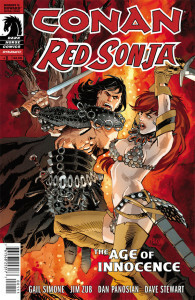 Have you seen Red Sonja before? I’m not lyin’.) Add that to the fact that I love mash up/team ups and this book is aiming right at that 12/13 year old pleasure center in my brain. And Gail, Jim and Dan hit dead center with this book. I want fun, I want action, I want classic battles, I want daring escapes, I want brazen thievery, I want solid steel to clash with ancient sorcery and this first issue delivers all that and more. You’ve got a mysterious treasure, a shady merchant, and some definite supernatural activity and we’re barely out of the first five pages. Plus, creepy seeds of doom have been sewn, so you know this is going to get ugly. Look I could sit here and break down the nuances of this story, but honestly, I’m two beers in and I had a great time reading this book because that’s what these kinds of stories are for me; just plain fun. You get to see both Conan and Red Sonja in what is clearly their younger years meet up, clash, team up and clash some more. Gail and Jim are delivering a solid Sword and Sorcery tale with two iconic characters. And Dan is bringing some fantastic images. This is a fun one.